I don't usually post public pictures of my daughter, but she really wanted to be part of daddy's photo project, so here she is on day five. 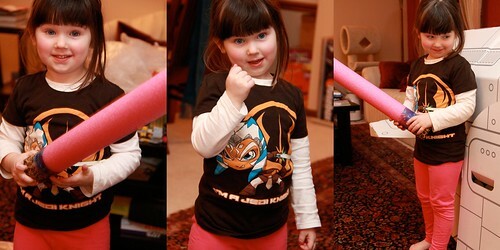 Claire wanted to show off her new Clone Wars T-shirt tonight--not only is she becoming quite the fan of the movies, often correcting the boys in her class on the finer details of the plot and characters--but she loves, loves, loves Ahsoka. Blue eyes? Check. Lightsaber? Check. Attitude? You better believe it! I couldn't settle on a single shot, so I punted and made a triptych out of three of my favorites.